Roco Line With Roadbed Is Back! 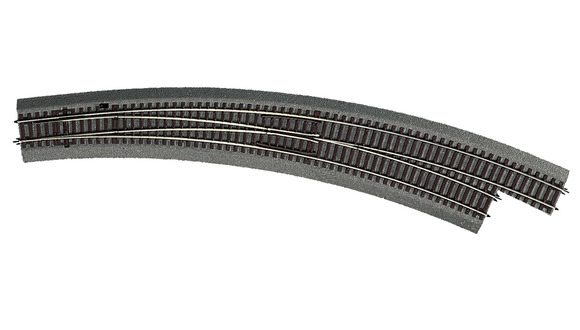 When it was introduced in stages in the late 1980s and early 1990s, the Roco Line HO code 83 track system drew an enormous amount of attention for its many innovative features. Both the overall system and individual components won model of the year honors and other awards from a range of European model railroad publications and organizations over several years. This new code 83 track system from Roco included both track with and without roadbed, a wide range of curve radii and specialized components — for example three different radii of curved turnouts — but also had a geometrical design that allowed the building of a wide number of configurations with only a few compensation pieces, which were usually supplied with switches. The track with roadbed looked good enough for installation on layouts (usually with a little bit of additional weathering) but was also solid enough to allow it to be stepped on by children when laid on the floor for a temporary setup. Of course, for those insisting on doing their own ballasting, there was always the track without roadbed, which had an identical geometry. Perhaps the most innovative feature of the track with roadbed was that it was almost infinitely repairable. Yes, some track configurations required cutting the roadbed shoulders, but not only was this easy to do with the soft roadbed material, but those roadbed shoulders could later be replaced (if the track was to be later used in a different configuration) and the repair would be almost undetectable. 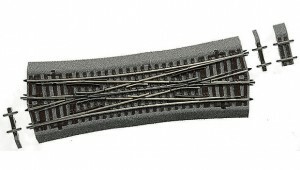 If the track itself was damaged but the roadbed still intact, the track was easy to replace by purchasing the matching component from the system without roadbed. A Roco catalog illustration from around 2001 shows some of the possibilities of the Roco Line track system with roadbed. In fact, the system’s modular design allowed most track pieces (switches were an exception) to be easily removed from their roadbed, making it easy to paint the roadbed. Switches with roadbed (with the exception of some simple versions supplied with starter sets) were supplied from the beginning with frog polarization, which worked even when the switch was used in manual mode — which required no additional manual switch operation mechanism. Purpose designed switch motors fit invisibly under switches with roadbed, and, in later years, also included switch motors with built-in decoders. The roadbed profile was to scale width, unlike some previously (and currently) available track with roadbed, where the roadbed is much too narrow, particularly for mainline tracks. Among other things, the Roco Line with roadbed track also provided a great way to display models set up on bookshelves. Dealers who still had Roco Line with roadbed items in stock considered them orphan items and put them on sale as remainders. But, those dealers failed to understand the popularity base for the roadbed track. Roco Line with roadbed gained a new life on the second-hand market, including on Internet sales sites such as eBay. As some items became scarce, used versions would often fetch double the price of the same items when they were new. So, in a way, Roco Line with roadbed never totally went away, though it was no longer in production. Roco, like many other model railroad manufacturers, got into financial trouble in the first decade of this century. All of these manufacturers had huge investments in the development of new models and were trying to outdo each other in the number and range of items being offered, often in a wide range of scales. Roco, for example, had even begun offering such fan items as jackets and umbrellas with the Roco label. It was only one example of Roco going “a bridge too far.” Roco had also decided to offer three different HO lines — Playtime, Professional, and Platinum. The first was an attempted to get more into the toy markets by offering items with so little detail that some “models” could at best be described as “crude.” There Roco was trying to enter an unfamiliar market segment. Because even the crude models had Roco drive trains, they were still on the expensive side for toys. And, if someone with Playtime “models” decided to get into serious model railroading, the Playtime items really didn’t fit in. And, the Internet greatly changed the world market place. Though Roco was probably not any more overextended financially than other model railroad manufacturers, the bank holding most of its loans decided to call in those loans and not to offer further financing, which might have carried Roco through some rough years. That forced Roco into bankruptcy. Well, as he was not happy with being forced out, that owner was not about to part with the patents for one of Roco’s signature products. So, the new owners of Roco who had acquired the assets of the bankrupt company from the bank, were forced almost overnight to come up with a new track system. That system was Roco geoLine. This new track system had a few of the features of Roco Line, such as being able to manually operate switches without a switch motor or other accessory control being installed, but had a far smaller range of track radii and other components. New Roco HO start sets now included the geoLine tracks. But, based on the Roco 2017 new items listings, the new selection of Roco Line roadbed products will apparently be essentially the entire range of products that was available in 2005. So, with more than a decade having passed and with several changes of Roco management in the meantime, Roco was able to come to an agreement with the owner of the Roco Line patents which allowed new production. Work on my previous layout convinced me that the next time around, I didn’t want to have to ballast every inch of track. So, track with roadbed — particularly a well-designed system like Roco Line — appeared to be the solution. I acquired my first pieces of Roco Line while it was still in full production. Then I bought a number of items when dealers had remainder sales after production ceased. But, about half of the track that I currently own was acquired in the last five years, as I began finalizing my track plan. And of that, about half of that was used, the remainder unused items that showed up from time to time. I’ve painted most of the roadbed and have been weathering track over the last few weeks, applying a light wash of rust. That’s something you can do with roadbed track, prior to installation. Would I recommend Roco Line with roadbed for others? Certainly. To use the larger radii, you really need a lot of space. But these radii do look impressive. The same is true for the 10 degree turnouts. Use these sparingly unless you have space to spare. On the other hand, I would stay away from radius R2 (there isn’t any R1) except for industrial tracks that will only be used by small switchers and short freight cars. That includes the R2/3 curved turnouts. Yes, my 1:100 passenger cars, longer freight cars, and all my engines will operate on R2 tracks (including R2/3 turnouts) on my current test loop, but the equipment just doesn’t look right, and backup moves can be tricky. You could run into problems with full-length 303mm passenger cars on parallel R2 and R3 tracks, particularly if those tracks include curved turnouts. Quick hints-Roco Line with roadbed products have 425xxx catalog numbers. 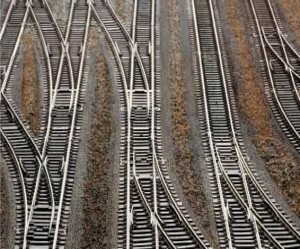 Matching Roco Line track without roadbed have identical 424xx numbers. Accessories, some of which are designed for only the roadbed line, while others fit both track systems, are in the 426xx catalog numbers. What will be the hot items? Undoubtedly the roadbed switch motors. These have been hard to come by, and used ones have been going for more than twice their original price. I’ve pre-ordered some at prices that are quite reasonable — and much less than switch motors offered by most other manufacturers. Another item that has been in short supply have been the R9 curved tracks. These are needed in conjunction with the R9/10 switches (of which there appear to be quite a few around, despite their space requirements) and for narrower spacing of parallel tracks. R10 is the counter curve for the 15 degree switches, but R9 can be used if you want a slightly narrower track spacing. On the whole, the renewed availability of Roco Line with roadbed is good news — except for those who have been making good money off of it on the used market. At the very least, these make great display tracks. While I am happy to answer questions about Roco Line with roadbed, as I own a wide range of components and have done quite a bit of research on it, I do not want to get into a debate here about whether Roco Line with roadbed is better (or worse) than some other track system. The track system that you choose, like many other aspects of model railroading, is a matter of taste. What satisfies one person may not do the same for another. Very interesting write up, Ernest. Too bad its HO! Still I enjoyed your description. I have a considerable amount of the rubber edged track including many new long points that are still boxed along with new boxed point motors and new boxed curves,I am seriously changing to an alternative as yet undecided, and would like information as to get the best market price, any information would gratefully received, I live seven miles north of Nottingham. Yours Mike Sherwin. The value of used model railroad equipment can fluctuate greatly. (I realize that you said that some of your items have never been removed from the boxes. However, at least in the U.S., the convention is that once an item has been sold by a retailer, it is “used.” It can be described as like new or some other way to show that it is in perfect condition. Assuming the vendor from whom you bought these items is still in business, you may want to contact that store to see if it would sell your items on a consignment basis. In such cases, the vendor gets a percentage of the sale, so it is in his interest to sell the item at the beat price. You can also look at the version of ebay for your country — or other country-specific online auction sites. But, be aware of the prices for the current new production runs of these Roco items. A used (pre-owned) price would have to be below those, as the new items would have a factory warranty. I obviously really like the Roco line with roadbed, and think it can appear quite realistic, particularly if it is painted and aged. I already have — or have on order — what I anticipate needing, and will likely not purchase any more of this track in the immediate future. I am using the long (10 degree) switches at only a couple of locations on my layout, simply for space reasons. As mentioned in the post above, Roco Line with roadbed can also serve as excellent display tracks on shelves. Fleischmann [or rather the holding company that owns Fleischmann and Roco] has announced that it is phasing out Fleischmann’s HO line. All HO toolings and supplies will go over to Roco. (Fleischmann will continue to produce N scale items.) Fleischmann HO will come to an end at the end of this year (2018). At this time it is not clear which Fleischmann items will continue to be available — but now with Roco catalog numbers. I expect that Fleischmann Profi couplers and similar basic supplies (unique to Fleischmann) will continue to be available as Roco items. As Roco currently has two different HO track systems, I doubt that it will continue Fleischmann tracks. So, if there are particular Fleischmann track components you really want, it would be best to order them now. 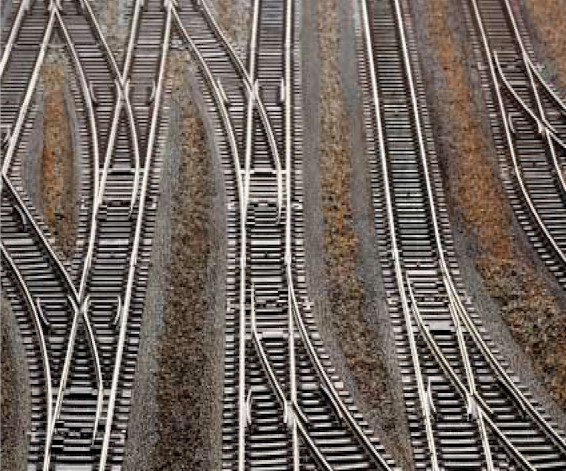 Of course, almost all HO track systems can be made to connect with each other. And, where a particular radius is not available in a particular track system, you can use flex track as a substitute. This year’s Fleischmann HO catalog will also be the last Fleischmann HO catalog. So, that may end up being a collector’s item. Great article!! I just found the REI blog! didnt know you had one. I also didnt know geoLine was from the ashes of Roco line track. I have decided to keep my Roco track but I have hit a problem that I would appreciate any help at all with ,namely how do you program Roco point motors using my preferred NCE Powercab controller ? I do not wish to purchase the somewhat toyish multi mous system and if a solution cannot be found what track with built in roadbed would anyone consider an equivalent as regards appearance and functionality , hoping someone can answer my dilemma ! Yours in anticipation . I would not sell the Roco Multimaus-based system short. It is one of the most widely used digital control systems in the world for a reason. Among other things, it is highly intuitive, and I could show someone how to use it within a few minutes. Yes, I have three Multimaus controllers myself. But, at the same time, as with most aspects of model railroading, each person has his or her own preferences. Programming any digital model railroad device, whether locomotive or turnout, is a combination of the attributes of the control system, the attributes of the decoder, and the attributes of the item being controlled. You may have to combine instructions from all three to get the desired result.  You are using analog Roco roadbed switch motors, controlled by a multi-port Roco switch decoder.  You are using analog Roco switch motors, controlled by a third-party multi-port switch decoder. In all of these cases, you will need a programming track connected to your control station, with only the decoder being programmed receiving the programming signals. I do not know anything about your control system, so, you will have to figure out on your own how to put it in switch programming mode and how to program switch addresses with it. You program the addresses for each bank of four addresses one bank at a time. When you assign an address to the first port on a bank, the first port receives that address; each of the following ports automatically gets an address one number higher. So, if you program the first port to address 9, the three other ports in that bank will get addresses 10, 11, and 12. You then do the same thing with the second bank of pots. You can program the ports on the decoder before it is connected to any turnout motors. Once the programming is done, you disconnect the third wire and you are now ready to install the turnout. If you are using a third party multi-port switch decoder, you will have to read the instructions for that particular unit as to how to place it into programming mode and how digital addresses can be assigned. Some will require you use consecutive addresses for consecutive ports; some will not. But all should work to receive commands from any data bus sending standard digital signals. Note that some third party decoders offer the option of either powering the decoder (and attached switch motors) from the digital bus or having a separate power source. The latter will help reduce the power demand on the digital control station or booster to which the decoder is connected. I’m in Brazil and I adopted the Roco Line with roadbed system. So far, so good. I’m about to buy some motors with decoders (the white ones), just waiting for some options (shipping costs). I’m also looking for clubs or specialized discussion groups of RL owners. The clubs in US or Europe, to visit when I travel and the discussion groups because I’m the only one I know of using this system in Brazil, so I’m looking forward to a technical group for discussion and research. I am not aware of any discussion groups or clubs specifically focusing on Roco Line track. Roco itself has published a variety of brochures on Roco Line over the years, and these sometimes show up on the used market. Roco currently offers a book of Roco Line track plans — which I have not seen — but which may provide some useful ideas. The Roco magazine, published by the company itself, has had numerous articles about Roco Line track. Subscriptions are expensive (and I am not sure the magazine is still being produced), but you can sometimes find back issues on the used market, such as on Ebay. I’m sure that Roco Line track comes up at times on various German model discussion forums — but these are, of course, all in German. Though I read and speak German, I normally don’t visit any of these forums on a regular basis — there’s just too much material to read. But, I have read some discussions on them when I was searching for particular information. Many European model clubs — particularly in Austria and Germany — use Roco Line without roadbed. During my travels in Austria, I managed to visit several clubs, even at times they were not normally open to the public, just by contacting them ahead of time. This year, for the first time in many years, Roco announced a new Roco Line item — R3/4 turnouts both with and without roadbed. So, I assume Roco will continue to expand the system — even though it already has a huge selection of track elements. I would hope that at some point Roco would offer equilateral (“Y”) turnouts. Don’t overlook German model railroad magazines, which typically review new items. I have subscribed to the Austrian magazine Modellbahnwelt for a number of years. It’s published six times a year and contains a lot of product information — as well as inspirational photos of layouts. I’ve painted and weathered almost all my Roco Line roadbed. That’s involved a lot of experimentation. Doing so will depend on what paint colors and equipment you nave available — and the effect you are trying to achieve.